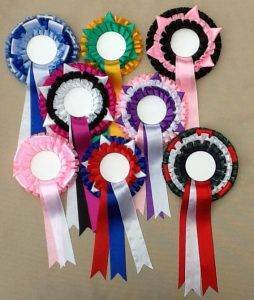 Our rosettes, badges and sashes are an essential part of Exhibitions Contest and Competition Awards. For exhibitions, manning of the promotional stand needs to show some corporate identity and project the correct message and image. Badges to identify the personnel are essential. 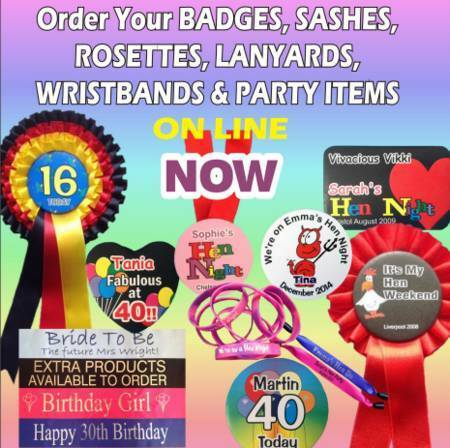 Sashes are a great way to promote special offers. They can also draw attention to your USP or promotional message. For organisers it helps either to identify the key show personnel or the 'go to' people in the event of any questions. Rosettes are also a valuable addition for the show organisers. For competitions and award occasions, then our sashes and rosettes are a key part of the event. We have the range of traditional 'place rosettes' where the colours of the ribbon can be chosen by you to reflect the theme or the event. The centre can have the placement - 1st, 2nd, 3rd etc and we can also print in full colour on the centre. Consequently, you are therefore not limited to a gold or silver blocked wording on a coloured disc. While our standard range is one, two and three tiered rosettes, we can also produce 4 tiers on request. The standard centre is 57mm, but again on request, we can make the centre larger (75mm). Hence this gives a much bigger rosette. The rosettes are made by us, on demand, and use the Elizabethan type of full box pleat, which gives a very luxurious appearance to the rosette. For the sashes we also can print with as much or little wording as you wish . There is no charge per word or letter , so you can have whatever you want. the only restriction is the physical size of the sash area where you can see the font. Also the more wording, the smaller it has to be.